Picture this: Your park has exactly $1.00 allocated to it for the entire fiscal year. Your park is new. You have just been appointed the Park Superintendent in your first Superintendency. You are responsible for over 1.6 million acres of California desert – a brand new National Preserve. Park operations do not stop. Park facilities must be cared for, visitors continue to show up, resources must be protected. There are six permanent park staff members, including yourself, who are dependent upon their National Park Service (NPS) salaries. This scenario is not fiction or speculation. It actually happened to Mary Martin when she assumed the Superintendency of Mojave National Preserve. The $1.00 budget situation borders on the unbelievable. However, the ways in which Mary worked to assure the park continued functioning and actually make phenomenal progress is an inspiring story of NPS’ers prevailing over almost insurmountable odds. So how does a Park Superintendent deal with a $1.00 park budget? As with most overwhelmingly difficult problems, one decides what is important and what is not. This is exactly what Mary did. She encouraged the park staff to work as a highly functioning team and then worked to get support and assistance. Mary forged partnerships with nearby parks for mutual support. Partway through the fiscal year officials allocated a very minimal budget through re-programming. Mary and her dedicated staff worked long hours to address the challenges they faced. One of Mary’s biggest coups was in gaining the support of many local political officials. Through force of personality and hard work she was able to convert the congressman for that area from a big time park detractor, and the originator of the $1.00 budget, into an enthusiastic park lover. During Mary’s ten-year tenure at Mojave Preserve the park successfully acquired nearly all the remaining Bureau of Land Management (BLM) grazing leases. Mary, in her creative way, put together several third-party purchases and agreements, thus allowing the removal of 8,000 head of cattle. At the time of transfer from BLM management to NPS, the BLM claimed there were about 400 non-native burros in the Preserve. During Mary’s years officials removed/adopted nearly 4,000 animals. The removal of these animals allowed the utilization of the sparse desert rain water and springs to support native wildlife and vegetation. Mining claims in the park were reduced from more than 9,000 to approximately 400 and many of these sites restored. Meanwhile, the park made major progress in its operations. It restored the decrepit Kelso Depot, which is now a popular visitor center with fully functioning interpretation. It built a new headquarters facility and completed its first General Management Plan. A variety of arrests and convictions occurred of individuals who were illegally dumping hazardous materials, poaching barrel cactus, baiting wildlife and illegally collecting reptiles. During her tenure, Mary built Mojave National Preserve into a fully functioning NPS area and its budget grew exponentially. When she left Mojave for her next assignment she received the highest accolade possible from the Sierra Club California/Nevada Desert Committee: Desert Heroine. Mary started her NPS career as the Human Resource Officer in Yosemite National Park. She later took her human resource talents to the Alaska Regional Office and the Washington Office. 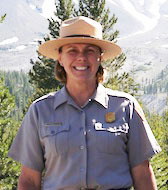 Following her service in Mojave National Preserve she was assigned as the Superintendent of Lassen National Park. Mary retired in 2007.